We have a new resident DJ! Yes indeed, moments ago, we crowned a new resident DJ. Or to be more exact, "the first official resident DJ of the Nü Qoöl". However you want to put it, we are beyond pleased to be able to announce Dan Sherman as a Qoöl resident DJ. Dan now joins Qoöl founder Spesh at the DJ helm of one of SF's longest running and most well regarded underground clubbing brands. Ever since it's inception, Qoöl has stood behind concepts and DJs that dare to be different. Actually that may be overstating things a bit. Often the difference is made with no daring involved, just a following of one's own path. The difference that Dan brings is along those lines. It's an independent streak that seamlessly flows from his personality through to his music. Dan marches to the beat of his own drum machine, and we like what we hear. You will too! Below, Dan Sherman answers our interview questions, including the a surprise question at the end. You can hear Dan play a 5 hour set at Qoöl on July 17. If you happen to miss that, check qoolsf.com for future dates! Qoöl: When and how did you happen to stumble upon the electronic music scene, and what about it grabbed you? Who was the first DJ that grabbed your attention? Dan Sherman: Well, a little history: I got into the electronic music scene in the late 90's, in Ames, Iowa, of all places. I'd been listening to electronic music for awhile at the point, stuff like 808 State, Aphex Twin, The Chemical Brothers, The Crystal Method, Propellerheads, Fatboy Slim, Orbital, The Orb, stuff like that. Then, I think around 1998 or 1999, these three DJs - Jack the Lad, Solarz and Kryptic - started a weekly house music night at this bistro in Ames, a bistro I happened to be working at during that time. The night was originally called Lock, Stock and Three Smoking DJs. It happened every Thursday night and I was there each week, not working, just observing the DJs mix and dancing and hanging out. That's when I became interested in DJ'ing. So, maybe after a few months, Jack the Lad sold me two 1200's, a mixer and about 200 records. I set everything up in my bedroom at home and began teaching myself how to mix through trial and error and factoring in what I learned from observation. Eventually, Solarz booked me for an opening gig (my first) on a Thursday at the bistro. And eventually, Solarz would move away, Kryptic would move away and Jack the Lad would move away, which left a void as far as managing Thursdays went. I took the night over, so I was now in charge of booking DJ's and promoting the party. I had a pretty good relationship with a guy who managed a copy shop in campustown: I'd provide free drinks for him and his friends each Thursday and in exchange he'd print off as many flyers as I wanted each week. A few friends and I would hang and distribute flyers all over campus (Iowa State University) and campustown every week to promote the party, and it worked beautifully. From there, over several years, I got gigs in other cities in the midwest. I eventually moved to Auckland, New Zealand and had a weekly residency at a small (now defunct) club on Upper Queen Street. When I came back to the U.S., I sort of let go of music for a few years, until moving to California. So, my initial involvement with the electronic music scene was in promotion. DJ’ing followed. What about the scene grabbed me? Well, first and foremost, and naturally, the music. I loved it, and still do, even more now (love at first listen). I fell in love with the "journey" feel of a mix, with the feeling of being told a story, and eventually came to see the DJ as a storyteller above all else, personally. Being around other people who shared that feeling was awesome and dancing with those people was a beautiful way to build friendships and connect in really deep ways. I think I was also a bit fascinated with the culture of the scene, with how music functioned as the center of gravity in that culture. The first DJ who really grabbed my attention? Well, make it plural. Sasha and Digweed. Northern Exposure. Hands down. That album blew me away, and it was the first time I’d been blown away by that (a mix). I lost track of how many times I listened to it. It was just such a beautiful, mysterious story, told so well, so seamlessly and you could listen to those mixes over and over again without getting tired of them or bored. Those two guys were pretty inspirational for me. I dreamed of being in their shoes, travelling the world, telling stories to people by mixing music and making people dance and wonder and dream for hours. Q: What is the role of music in your life? DS: Music has played a pretty central role in my life for a long time. I guess I emote through music. The way you can communicate through it, through mixing, I don't know, there's something pretty magical about it to me, about finding ways to string together tracks in a way that tells a story and expresses emotions and makes people feel all sorts of feelings that can, honestly, at times, be quite life changing. It's therapeutic too. I use it to bring myself up when I'm down and make myself go round and round (in a good way). I use it for meditation and to understand myself, through examining the emotions that get expressed, intentionally or intuitively or both, in what I create. Being out in a club with friends and dancing to beautiful music being mixed beautifully by a DJ - it's the best therapy I've come by in life so far. It's inspiring too. I think I originally fell in love with electronic music because of how much I daydreamed when I listened to it, and because somehow that daydreaming functioned as some type of inspirational energy I could use in a variety of ways. So, there’s a lot of utility in music for me, and a lot of joy. It’s indispensable. Q: We noticed that you are very active on the controls when you mix, almost constantly manipulating the sound. Is that something that you just do naturally, or did you evolve that approach to create a certain sound or feeling in your DJ sets? DS: So, a bit of both, I think. I don't know when, but at some point I guess I just got bored or antsy (or both) between tracks while mixing. I mean, structurally, most (not by any means all) mixes to me seem to be track/mix/track/mix and so on, and while there's knob twisting and effects and whatnot going on during mixes and also outside of mixes, I'm used to feeling like what I'm hearing is one track, then another track being mixed in while the other is mixed out, and then that new track, and so on, with about at least two or three minutes where the new track stands alone. I don’t have a problem with this. I love mixes like that and listen to them all the time. But, when I played, I found myself getting bored during that stand alone time, and my response was to try to always be mixing, where then the structure is more like mix/mix/mix and there's as little stand alone time as possible – you’re constantly mixing, or very near constantly. And I learned from this that one result is that there isn't much time to drink a beer. Another result, I think, is that your programming becomes much more improvisational, where instead of having two or three minutes in between mixes to figure out where people are and what to play next, you force yourself to make your next pick as quickly as possible, maybe in twenty or thirty seconds or less. And for me I feel like that forces me to know my collection more deeply. It’s like telling a story that you’re making up as you tell it. And it helps to generate or cultivate and improve some sort of intuition the more I do it, not intuition that necessarily relates to dancing, but maybe that relates more to storytelling. And, it feels more dynamic. My preference, both in listening to others play music and in playing music myself, is to have things be really dynamic as often as possible. Exercising some restraint so things aren't too dynamic is necessary though. So I do think things can be too dynamic, there can just be too much going on – you don’t want the story to be to complex or hard to follow. You want it to take you in. Sometimes I do too much though, but I don’t know if it’s too much mixing as it is too much twisting of knobs and cutting in and out with the volume faders and using effects too much. I do, however, think that really awesome stories can be told that aren’t that dynamic, that don’t necessarily have long mixes or that are more minimal or atmospheric or more restrained. And I’m not against or averse to stand alone track time at all. It’s just when I play live, my nature tends towards doing a lot but not too much. Q: Do you think the growing phenomenon of experiencing DJ sets on-line through sites like Soundcloud, Mixcloud and Boiler Room has in turn influenced the sound of underground club music in general? In other words, do you think a lot of DJs are tailoring the vibe of their mixes for solo listening experiences instead of for the dance floor? DS: Yes. When I'm at home or at work or hiking or hanging out on the beach or whatever, via Soundcloud or Mixcloud or Boiler Room or a download, the sound system won't really matter, and there isn't a dancefloor or lights or a bar and just that sense of environment and occasion - but you can have really awesome experiences listening to mixes on your headphones or in a living room or with a boombox on the beach, and whether they're awesome, I think, now doesn't depend on the lights or the sound system or orchestration of some party or festival and all the rest that goes along with that. Whether they're awesome mixes depends solely, or near almost solely, on the mix itself, the tracks, the order of the tracks, the manner in which the DJ intertwines all of them over the course of the mix. So, if you know that when you're making a mix, you're making it for that type of environment and occasion, rather than a club environment and occasion. It matters a lot if dancing is a central component of the experience. If not, you make the mix this way, rather than that way, so you tailor it depending on how it's going to be experienced. An ambient mix in a big club which has a bunch of people that want to dance, that mix may not do well - but an ambient mix you listen to while hiking through a forest, that may change your life. So yea, I think there are a lot of DJ's making mixes exclusively for solo listening experiences. I think it's awesome. It's a good thing. I think it results in more experimentation and variety. Is this affecting the sound of underground club music in general? I can't say with any surety. I guess it depends on what people want out of the experience of going to an underground club. I think it's pretty common for people to want to dance in that context, but I don't think it's impossible, or unlikely, that people may want to forego the dancing for something a bit less dance-able, but that's still awesome to experience. The latest example of this for me was seeing Patrice Baumel. And while it was natural to move your body to the music he was playing, it was also a different type of experience, more of like a kind of still, relaxed reverence for what was going on. Q: Pick a moment in your relationship with music and describe it. DS: Hmm. Well, there are a lot. The first one that jumps to mind was when I played Qoöl last October. I opened the evening, starting at five and going until about seven or so. Few people were there. Among them, a friend and an incredibly beautiful woman. Aside from them, I don't know, maybe there were no more than ten other people, maybe less. 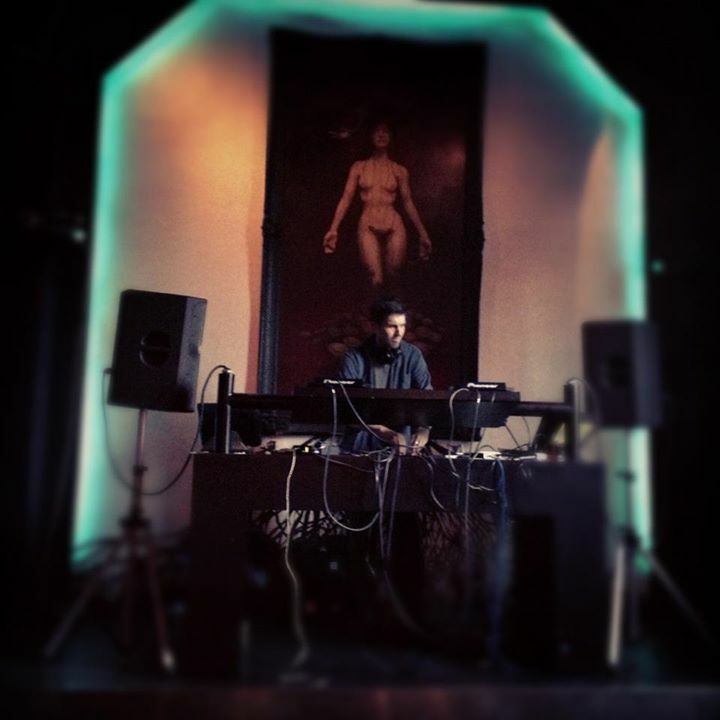 I'd acquired a lot of fresh music for the gig and hadn't played on a system like that in some time, and I was just happy to have the opportunity to play, and play there, particularly for Qoöl (thanks Spesh). Well, it ended being one of the best sets I feel like I've ever performed, maybe the best, and it didn't matter at all that hardly anyone was there, and it was cool that it didn't matter. It was intimate. Personal. And at least for me, powerful, in some way. I've forgotten about a lot of the times I've played, but it's not possible to forget this one. Q: You have been toiling away as the "unofficial Qoöl resident DJ" for a while now, so we would like to ask you, right here in this little interview, if you'd like to be the first official resident DJ of the Nü Qoöl. How about it? DS: (hopping aboard) Thank you. (handshake and smile) Happy to be part of the crew, Captain. Q: We couldn't be happier to have you, sir! Dan Sherman. He's actually taller in person. Qoöl resident DJ Dan Sherman, massaging your ears at Qoöl.